My colleagues engaged in the Shakespeare authorship question have been discussing the cryptic dedication of the Sonnets. The search continues for hidden meanings, anagrams, secret codes, etc., and I’ve no doubt that such information exists. The design of the dedication has three inverted pyramids; each word is followed by a dot or period — indicating, it would seem, the presence of partially hidden information. “All happiness and that eternity promised by our ever-living poet,” wisheth the Well-Wishing Adventurer in setting forth. THE ONLIE BEGETTER =MR. W.H. MR. W.H. = This is the onlie begetter of the sonnets, Henry Wriothesley, Earl of Southampton, his title “Lord” reversed to “Mr.” and his intitials “H.W.” reversed to “W.H.” — reflecting the reversal of his title and status while in the Tower during 1601-1603. He had been found guilty of high treason and sentenced to be executed, but his life was spared and he remained in prison as the base commoner “Mr. Henry Wriothesley” or “the late earl” in the eyes of the law — that is, he was legally dead. THAT ETERNITIE PROMISED = the eternity promised to Southampton by the author, Lord Oxford, his father: “Your name from hence immortal life shall have” – Sonnet 81; and so on. OUR EVER-LIVING POET = Edward de Vere Earl of Oxford (1550-1604), whose signature word was EVER for “E.Ver”. In 1609 he is “ever-living” or deceased. “That ever-living man of memory, Henry the Fifth” – 1 Henry VI, 4.3; but he would have crafted the dedication before he died. THE WELL-WISHING ADVENTURER: This is also Oxford, who in the 1570’s had been an “adventurer” or investor in the Frobisher voyages to find a Northwest Passage to the Orient. SETTNG FORTH: Oxford is “setting forth” the truth of Southampton as a king or “god on earth” in these sonnets. “I here pronounce this workmanship is such/ As that no pen can set it forth too much” – Ignoto, undoubtedly Oxford himself, in The Faerie Queene by Spenser, 1590. 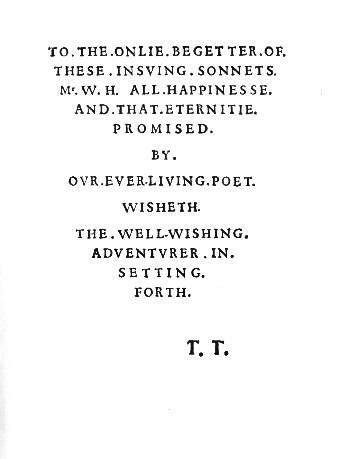 Oxford must have composed and arranged the dedication of the Sonnets himself (without the “T.T.” referring to Thomas Thorpe, the publisher) prior to his death on June 24, 1604, when he was also “setting forth” from this world. “Other commentators have preferred to interpret ‘begetter’ as ‘the one who obtained the manuscript for me’. 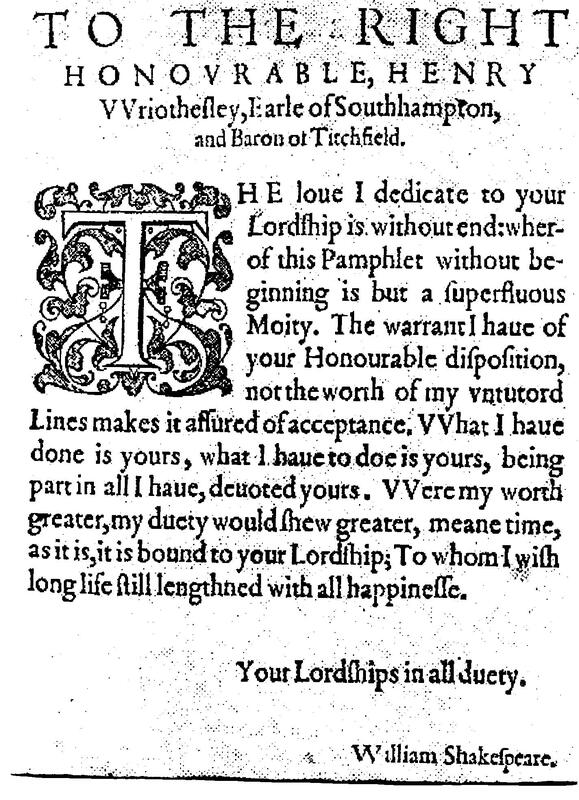 If, as has been suggested frequently, this book is a pirated and unauthorised printing of the sonnets, it seems unlikely that Thorpe would choose to trumpet the fact to the world and praise the one who had stolen the manuscript. The entire credit of the book and its salesworthiness depended on people believing that it was genuine Shakespeare. To give the game away that it was a stolen copy and not necessarily even by Shakespeare would have undermined its potential attraction to readers, not to mention the damage it might do to Thorpe himself as a publisher. Would he really wish to have portrayed himself as a purloiner of other men’s works? But here’s the joy: my friend and I are one. Addendum: Dr. John Rollet’s discovery of “These.sonnets.all.by.ever.”, using the 6-2-4 pattern of the lines in the triangles of the dedication to decode it, enforces Whittemore’s acceptance of Edward de Vere (e ver) as the author of the sonnets. Including the front, back and blank sheets, exactly how many pages are there in the 1609 quarto of Shakespeare’s Sonnets? If you really know the sonnets you’ll know the book. Hi Tom – a good question. If memory serves the sonnets go up to page 70 and A Lover’s Complaint to page 80, but after that must be a number of blank pages. I have no idea of the latter. Might the number of blank pages be important? First, I love your site and I admire what you have discovered and are sharing with all of us. I also admire your courage to stand up to all the criticism that even Oxfordians have regarding the Prince Tudor theory. I also resisted at first but I kept reading and I believe you have found the best interpretation that seems to reveal the hidden truth–it makes sense that the hardest thing to see is something unexpected. But looking back at the plays and poems it is a theme played over and over. I just wanted to comment (I apologize since I don’t remember the name of the person who brought up this solution in the letter section of Shakespeare Matters) but they said the pattern of the Sonnet’s dedication looks more like 6-1-1-1-4 rather than the 6-2-4 division that Dr. John Rollet uses. (The 6-2-4 division seems to be derived from knowing that there are 6 letters in the name “Edward” and 2 letters in the word “de” and four letters in the word “Vere”). A true key wouldn’t assume the person trying to decipher it would know the answer ahead of time in order to guess the number choice. With the 6-1-1-1-4 count the message would then be: “of these ensuing sonnets all promised by our ever (e. ver(e)) the setting forth TT” It doesn’t seem to make a lot of sense but then he went back to the first line and counted to the 4th “t” and the word was “begetter”. I don’t know if this is correct but it seemed to fit better than most translations of the code that was offered using the dedications arrangement and the full stops for each word. Also, I wondered do you think anyone will be able to get permission to have an extensive investigation done on the Pregnancy painting of Elizabeth 1–still in possession of the Royal Family (that Dr. Altrocchi has written about)? Since it has already been physically tampered with and even renamed as the Unknown Woman–it’s just very frustrating to have so much right there and the wrong group having control over it. Like knowing that DNA testing is possible now and things could change quickly but for these artificial barriers of having Queen Ellizabeth 1 still off limits. Thanks for writing and for the kind words. On the matter of the dedication code, I don’t recall either who brought up that solution. I don’t have expertise in this area — for me the Sonnets themselves are not written in “code” but according to a double-image language that is very close to allegory (but different). Anyway, you bring up an interesting point that a “true key” wouldn’t assume prior knowledge on anyone’s part. But Dr. Rollet had landed upon the key not at all with prior knowledge; instead, he saw the three inverted triangles or pyramids and counted their lines as 6-2-4 and decided that was possibly the key. He had never heard of Edward de Vere. When he landed on “These sonnets all by Ever” — he had no idea who “ever” might be. So the idea is that the design of the dedication led to the counting of the lines that resulted in a code. How did someone come up with 6-1-1-1-4? I agree that it’s frustrating to be unable to do testing. I wonder if those in control are aware of the surrounding controversies. Probably they are:-) I am all for DNA testing with Elizabeth and Southampton etc. Again, I am no expert, but would welcome any kind of accurate tests. Let us know whatever more you learn about these matters. Cheers! Woops–This is what I get for typing a reply at work–I see the mistake I made originally when I wrote 6-1-1-1-4….it should be 5-1-1-1-4. Thank you for catching my mistake. I don’t know if 5-1-1-1-4 is the right “code” for the dedication but it looks more like that to me than the 6-2-4. I do think that the dedication has a code to it but that the sonnets themselves are a much more difficult translation that I think you have finally found the key. Thanks again. How did you arrive at 5-1-1-1-4? 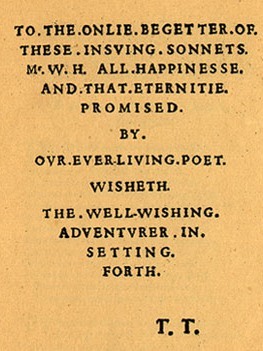 In setting forth these insuing sonnets our poet and tt adventurer wisheth Mr W Hall that eternitie of happinesse promised by the ever-living onlie begetter to the well-wishing. The dedication is simply a prayer for the soul of the recently dead william hall of acton, father of the doctor john hall who married shakespeares daughter and set up his practice in stratford.